Cytomegalovirus (CMV) Infection, also known as herpesvirus type 5, is a common virus belonging to the herpes family that affects a variety of individuals across the lifespan. It is currently the leading cause of congenital infections in the world, and can cause long term consequences such as hearing loss, visual deficits, and cognitive delays. It is frequently acquired in late childhood or early adulthood, and is rarely symptomatic, except in the immunocompromised. Reported incidence of CMV varies. Recent evidence suggests that one percent of newborns have the virus, as well as eighty percent of people over 35 years of age. Other studies report that 50-80% of people are infected with the virus, and up to 90% or more in developing countries. After infection, the virus may remain latent within monocytes, frequently causing it to be difficult to detect. Therefore, true prevalence may be different than numbers reported. CMV seroprevalence (shaded). Congenital CMV birth prevelance (circles). 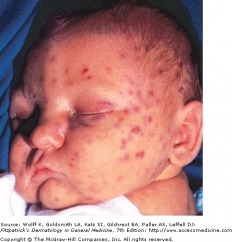 The most common treatment for CMV includes antiviral use, such as Ganciclovir (intravenous) and Valganciclovir (oral). Less common medications include Foscarnet and Cidofovir. Ganciclovir works by inhibiting the replication of viral DNA by ganciclovir-5’-triphosphate, which involves inhibition of the viral DNA polymerase. The use of two vaccines is currently being investigated in phase II and phase III clinical trials in healthy, postpartum females and transplant recipients. More research must be completed in this area to determine if CMV vaccinations are effective. Individuals who have the disease but are asymptomatic are not typically treated. There are different diagnostic processes for adults with CMV and for children with CMV. Fetal diagnosis is made by assessing the DNA in the amniotic fluid by amniocentesis. Prenatal ultrasounds or MRI imaging of the fetal brain or fetal blood biochemistry can help determine the overall health of the baby to determine an appropropriate prognosis. This is useful because diagnosis does not equate to expression of symptoms. Lab values such as thrombocytopenia and high serum levels of beta-2-microglobulin can also aide in developing a prognosis.These values can be determined after cordocentesis, which detects abnormalities in the fetal blood. After birth, diagnosis is made by a positive urine culture or polymerase chain reaction. As an adult, diagnosis is made by detection CMV ImM in blood or the protein pp65 antigen by a PCR test. CMV can also travel through the placenta from mother to child. Although less common, CMV can be transmitted during organ transplants and blood transfusions. Transmission from person to person via the hands can also occur, although evidence is inconclusive as to whether health care workers that care for affected individuals are at a greater risk for contracting the virus. There has been little research on the indications of the use of physical therapy for those with cytomegalovirus. Typically those diagnosed with CMV willl not receive treatment unless immunocompromised. The virus is typically managed with the appropriate medications that are listed above. Physical therapy may be useful to treat the physical, neurological and cognitive impairments that are associated with cytomegalovirus. There can be motor deficits and cognitive delays that occur as a result of the virus that physical therapy can address to help improve the overall function of the individual. Cytomegalovirus is frequently misdiagnosed as mononucleosis or influenza due to symptoms such as muscle aches, fever, enlarged lymph nodes and/or spleen, loss of appetite, and fatigue. Any immunocompromised or pregnant individual experiencing constitutional symptoms (fever, chills, fatigue, loss of appetite, etc) should seek medical attention immediately. Simioni C, Sanchez Oliveira R, Moscovi T, D´Agostini Deutsch A, Cordioli E, Santos E. Twin pregnancy and congenital cytomegalovirus: Case report and review. Journal Of Maternal-Fetal & Neonatal Medicine [serial on the Internet]. (2013, Apr), [cited April 4, 2016]; 26(6): 622-624. Available from: Academic Search Complete. Kaul D, Stoelben S, Cober E, Ojo T, Sandusky E, Rubsamen-Schaeff H, et al. First report of successful treatment of multidrug-resistant cytomegalovirus disease with the novel anti-CMV compound AIC246. American Journal Of Transplantation: Official Journal Of The American Society Of Transplantation And The American Society Of Transplant Surgeons [serial on the Internet]. (2011, May), [cited April 4, 2016]; 11(5): 1079-1084. Available from: MEDLINE. Do not share food, drinks or utensils used by young children. Do not put a child’s pacificers in your mouth. Do not share a toothbrush with a young child. Avoid contact with saliva when kissing a child. Comparison of the LIAISON®XL and ARCHITECT IgG, IgM, and IgG avidity assays for the diagnosis of Toxoplasma, cytomegalovirus, and rubella virus infections. ↑ 1.0 1.1 1.2 1.3 1.4 1.5 1.6 1.7 Goodman C, Fuller K. Pathology: Implications for the Physical Therapist. 3rd ed. St. Louis, Missouri: Saunders Elsevier, 2009. 336-337. ↑ 2.0 2.1 2.2 2.3 2.4 The University of Chicago. 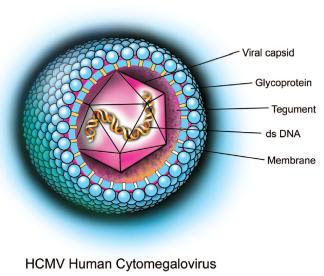 Cytomegalovirus (CMV). https://pedclerk.bsd.uchicago.edu/page/cytomegalovirus-cmv (accessed 04 March 2016). ↑ Dollard S, Grosse S, Ross D. New estimates of the prevalence of neurological and sensory sequelae and mortality associated with congenital cytomegalovirus infection. Reviews In Medical Virology [serial on the Internet]. (2007, Sep), [cited April 4, 2016]; 17(5): 355-363. Available from: MEDLINE. ↑ 4.0 4.1 4.2 Guo R, Gebreab F, Tang E, Piao Z, Lee S, Perez M. Cutaneous Ulcer as Leading Symptom of Systemic Cytomegalovirus Infection. Case Reports In Infectious Diseases [serial on the Internet]. (2015, Feb 16), [cited April 4, 2016]; 20151-4. Available from: Academic Search Complete. ↑ 5.0 5.1 Ohlin M, Söderberg-Nauclér C. Human antibody technology and the development of antibodies against cytomegalovirus. Molecular Immunology [serial on the Internet]. (2015, Oct), [cited April 4, 2016]; 67(2 Pt A): 153-170. Available from: MEDLINE. ↑ Scripps. CMV - pneumonia. https://www.scripps.org/articles/3053-cmv-pneumonia (accessed 04 March 2016). ↑ Altaweel, M, MD, FRCSC, Youssef, P, MD. 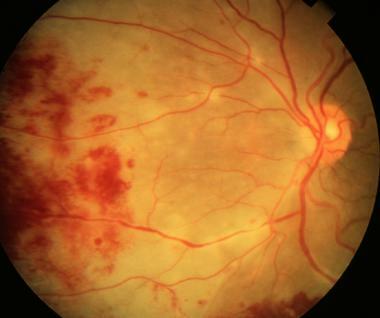 CMV Retinitis. http://emedicine.medscape.com/article/1227228-overview (accessed 04 March 2016). ↑ Matthews T, Boehme R. Antiviral activity and mechanism of action of ganciclovir. Reviews Of Infectious Diseases [serial on the Internet]. (1988, July), [cited April 5, 2016]; 10 Suppl 3S490-S494. Available from: MEDLINE. ↑ Rieder F, Steininger C. Cytomegalovirus vaccine: phase II clinical trial results. Clinical Microbiology & Infection [serial on the Internet]. (2014, May 2), [cited April 4, 2016]; 2095-102. Available from: Academic Search Complete. ↑ 10.0 10.1 Desveaux C, Klein J, Leruez-Ville M, Ramirez-Torres A, Lacroix C, Ville Y, et al. Identification of Symptomatic Fetuses Infected with Cytomegalovirus Using Amniotic Fluid Peptide Biomarkers. Plos Pathogens [serial on the Internet]. (2016, Jan 25), [cited April 5, 2016]; 14(1): 1-21. Available from: Academic Search Complete. ↑ 11.0 11.1 11.2 11.3 Bilavsky E, Schwarz M, Bar-Sever Z, Pardo J, Amir J. Hepatic involvement in congenital cytomegalovirus infection - infrequent yet significant. Journal Of Viral Hepatitis [serial on the Internet]. (2015, Sep), [cited April 4, 2016]; 22(9): 763-768. Available from: MEDLINE. ↑ 12.0 12.1 12.2 Lazzarotto T, Guerra B, Lanari M, Gabrielli L, Landini M. New advances in the diagnosis of congenital cytomegalovirus infection. Journal Of Clinical Virology: The Official Publication Of The Pan American Society For Clinical Virology [serial on the Internet]. (2008, Mar), [cited April 5, 2016]; 41(3): 192-197. Available from: MEDLINE. ↑ 13.0 13.1 13.2 13.3 13.4 13.5 Gonzalez, S. Cytomegalovirus (CMV) Infection. http://www.medicinenet.com/cytomegalovirus_cmv/page4.htm (accessed 07 March 2016). ↑ Blaus, B. Amniocentesis. 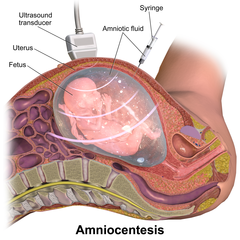 https://commons.wikimedia.org/wiki/File:Amniocentesis.png (accessed 07 March 2016). ↑ Center for Disease Control and Prevention. Handwashing: Clean Hands Save Lives. http://www.cdc.gov/handwashing/when-how-handwashing.html (accesed 04 March 2016). ↑ Center for Disease Control and Prevention. Cytomegalovirus (CMV) and Cytomegalovirus Infection. http://www.cdc.gov/cmv/testing-diagnosis.html (accesed 04 March 2016). ↑ Centers for Disease Control and Prevention. Preventing Congenital CMV Infection. http://www.cdc.gov/cmv/prevention.html (accessed 07 March 2016). ↑ Angelsharum. https://commons.wikimedia.org/wiki/File:Handwashing.jpg (accessed 07 March 2016).